I am working on a project that requires finish sanding of multiple multiple small parts. To help in this I am trying to find a belt sander that I can use to speed up the job and save my arms. In looking at belt sanders my fear is that even the slowest ones at ~1800 fpm are still to fast. In calculating a 'hand sand' fpm I am coming up with ~200 fpm. So I am entertaining custom building a sander that I can reduce down with pulleys to ~200 fpm. Does anyone have experience or advice on finish sanding with a belt sander. Dont sweat the speed. With a sharp belt, burning with a 220 grit belt is a non-issue, but note that with a sharp belt. If you try to press an old belt into service, itll burn. You do run the issue of sanding with too heavy of a hand, but a slower sander wont prevent that either. Light touch and dont force things and youll be fine. GeorgeC, Jay C. White Cloud and mjadams61 like this. Agree. It is not the speed that is the major factor, it is the best quality. You really don't want a sanding belt that fine. 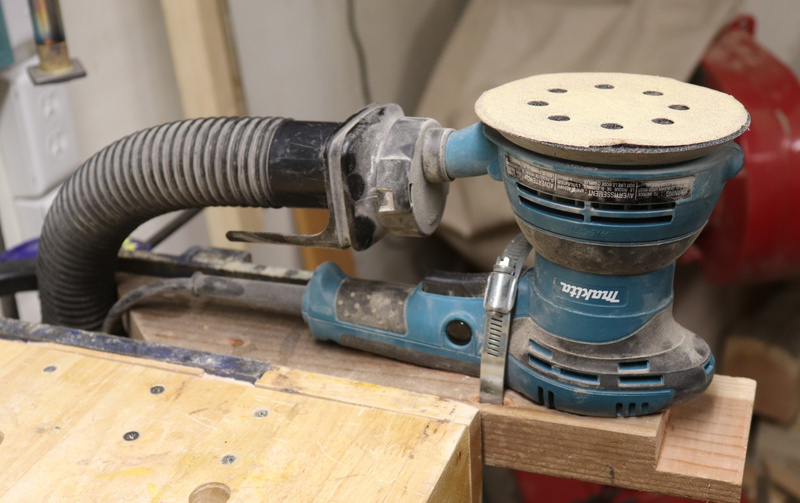 A belt sander is more for rough sanding wood to remove defects and planer marks. Regardless of the talent of the operator a belt sander makes dents in the wood. Of course the better a person is with the belt sander the fewer dents you make but everybody does it. The finish sanding should be done with an orbital sander which will sand the surface flat. bargoon and NoThankyou like this. I tried an orbital sander multiple times and it left my hands numb after, so I went back to hand sanding. While hand sanding, I got the thought why can't I do this exact thing with a belt and move the paper instead of the part. I am going to buy 5 220 belts and try the light touch. Follow up, what are the thoughts on water treatment to bring out the grain? Required if finishing with only mineral oil? I uploaded some of the parts I am finishing, any advice is greatly appreciated. This suggestion is not going to help you with this project, but it may help you with future projects. I usually try to sand my boards before cutting them into small parts. I still have to do some finish sanding after the parts are cut, but there is much less sanding at the end of the project. GeorgeC and NoThankyou like this. Ain't technology grand........when it works. Like he said but I bought a small porter cable beltsander and I practice using it on some scrap wood. It still have some weight to it compared to full size hand held belt sanders and I find that just controlling it and letting the belt sander own weight do the job and I never had any problems especially with sharp 220 grit. This is how I do my fine sanding. Orbital sanders are brutal on hands/arms. I use 120/220/400 on this. Works very well for small parts. I am a huge fan of..."wet sanding"...in many forms. It cleans the wood as well as leaving a more satin effect on the wood which also tends to "fuzz" less when a final finish is applied. I would also offer, that instead of a Belt Sander that you try a "Finishing Sheet Sander" perhaps? Sanding is nothing more than "planning wood" with thousands of little plane blades. However, that is not how it is looked at or treated in "modern woodworking." "Sanding" (or Polishing) wood has been around longer than the hand plan actually has been. Yet, most books and related text do not look much beyond the European traditions of the craft. Nevertheless, finishing methods like "French Polish" and related methods around the glob's woodworking cultures have all relied on "sanding methods" for millenia. 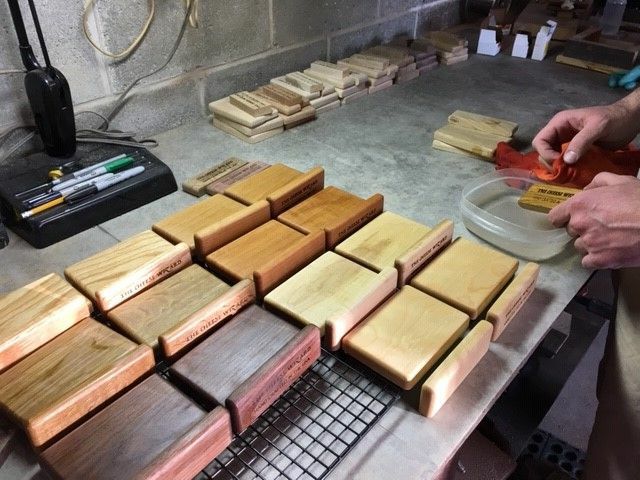 Volcanic and sand pumice, Ray-Shark Skin, Horse Tail Reed, and many other natural sanding and polishing agents all lend themselves to really understanding how..."sanding"...evolved. As such...I would go with a lot finer sand paper than 220 alone if you wish for a really smooth finish...or!! !...Use a very sharp plane and be done with it. If I do use a good hand plane I would never touch the wood after unless in the 1000 grit range. Even on bare "green" wood you can raise a polish with proper sanding modalities that will let you see your reflection in the wood once the means and method of sanding are understood and practiced. You can then choose just how smooth you wish to make something...Food for thought? You really don't want a sanding belt that fine... Of course the better a person is with the belt sander the fewer dents you make but everybody does it. The finish sanding should be done with an orbital sander which will sand the surface flat. Sorry...that simply is not the experience of anyone I know of in woodworking that routinely uses belt sanders...?? ?...That seems like a "bad tool" or some other challenge taking place? I have used belt sanders for decades (as do most of my colleagues) and have never had any issues with "dents.". If that is taking place, then the tool is being pushed past its limitations and/or used incorrectly...or...that is a badly designed belt sander? Confucius (551 BCE): "I hear and I forget. I see and I remember. I do and I understand..." "...Real knowledge is to know the extent of one's ignorance..." Socrates:“I cannot teach anybody anything. I can only help them think..."
Stephen Covey:"Seek to understand, before seeking to be understood..."
Last edited by Jay C. White Cloud; 04-13-2019 at 10:26 AM. Maybe not your experience but is the experience of every single person I know that uses a belt sander. Perhaps dent isn't a good description but it is a depression ground by the corner of the belt sander if you let it tip slightly. It's so shallow you can't see it when you do it or even when you stain it. It only shows up after putting a few coats of a film finish over the top. Perhaps since you finish with an oil finish you just have never seen it. .... Perhaps since you finish with an oil finish you just have never seen it. It's not just the novice, I started in woodworking when I was 18 and now I'm 64 and still occasionally make a mark in the wood with a belt sander. My solution was to purchase a stroke sander. There are belt sanders that offer a 1 inch belt (maybe 1.5). I think that I bought mine at Harbor Freight for $32 with a 20% off coupon. The belt seems to run slower than either my ancient Craftsman hand held or my Porter Cable hand held. Like most HF tools, its one job was to round the corners of tenons. A 'Four in Hand' or rasp does a better and quicker job. I would rate it at a MEH. 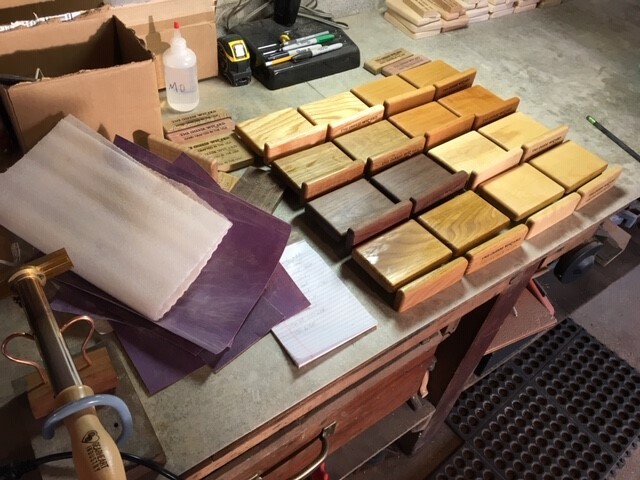 When looking at your project, I would do the sanding with a block by hand. And as Jay said, I'm not a fan of a mineral oil finish either as it doesn't cure. If you have an aversions to Minwax Antique Oil Finish or Watco, I would suggest walnut salad oil as it does cure eventually and is food safe. You can find it in the salad oil section of the grocery store or at some woodworking stores. Jay C. White Cloud and Tool Agnostic like this. I use to have the dip issue UNTIL I started buying good quality belts....NOT ALL belts are joined the same and some cause a bump/divet every round it makes as the joint goes around/between the sander pad/base and the wood. Reveling God's awesome beauty while creating one of-a-kind flitches and heirlooms. Thank you guys, I finally picked up my father in laws bench top belt sander over the weekend and have 220 belts and very fine surface conditioning belts on the way. I like the note about sanding as much as possible before parting off, my hope with the conditioning belt is to hit the router edges quickly and move on. As for the mineral oil finish, I need something food safe and is not tacky while drying or curing. ...Thank you guys, I finally picked up my father in laws bench top belt sander over the weekend and have 220 belts and very fine surface conditioning belts on the way. I hope the bench version works well for your needs! ... like the note about sanding as much as possible before parting off, my hope with the conditioning belt is to hit the router edges quickly and move on. Sanding before assembly is usually (almost always?) a better option. You may also try keeping a atomizing spray bottle close by with Alcohol in it to keep dust down and try a bit of "wet sanding." It not only helps keep dust down, but also tends to clean the wood while sanding and leaves a more satiny smooth finish on the wood that fuzzes less when the first coat of finish begins to dry. 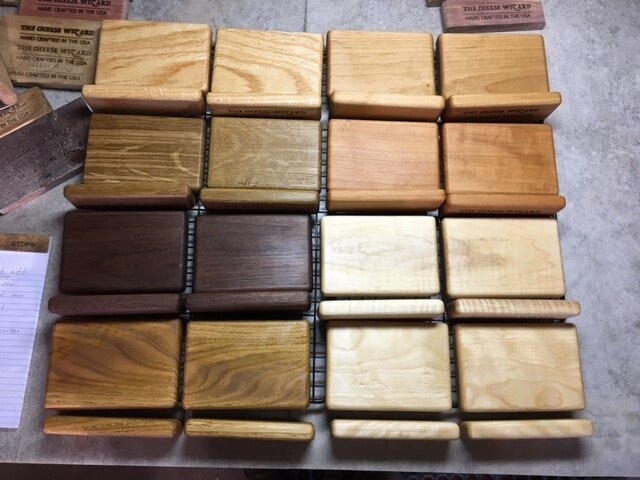 I will also, quite often, if at the 120 grit or less level spray the wood down lightly with the finish and sand it in. It keeps dust down as well as creating a smoother final finish. This is a really light coat, even a finished damp rage can work for this. Combining the two (alcohol-finish) also has good effect as well...See what works best for you? However, linseed, tung, citrus, walnut, coconut, and several other natural oils are used often. For your application, I will offer you my "go to" day to day oil blend I use. I have used it for 30 plus years, and the formulation is over 2000 plus years old in service application. I typically use so much of it that it purchase by the 50 gallon barrel!!! It's a blend of Flax, Tung, Citrus Oil blended with Beeswax and Pine Rosin. Note: even with it being inside I recommend the exterior grade. The mineral based UV stabilizer mitigates a finished piece from getting sun bleach if it gets too much through a window. Let me know if I can expand on anything? I will get a belt cleaning block ASAP. The YouTube videos of the block working on a dirty belt is pretty satisfying. Do you suggest a water treatment to bring out the grain then sand it off, water again, sand, water, sand... until the grain no longer raises with water contact. Would alcohol have the same effect? All of your help is greatly appreciated!